Police Friday sought the public's help in locating a transient who they said punched, strangled and raped a woman in a secluded area of a Metro Red Line station in East Hollywood. The victim asked the suspect for directions about 6 p.m. on March 16 in the 1500 block of North Vermont Avenue, then lured her into a secluded, emergency exit-room at the Metro Red Line station, where he punched, strangled and raped her, the Los Angeles Police Department reported. The suspect, who police said frequents the Metro stations from Compton to Santa Monica, has brown eyes and is between 5 feet 7 and 5 feet 10 inches tall, and between 165 and 180 pounds, with a shaved head, an earring on his right ear and a 2 to 3-inch scar on his left forearm. He wears all dark clothing. LAPD Northeast detectives asked anyone with any information regarding the suspect or his whereabouts to call them at (323) 561-3328. 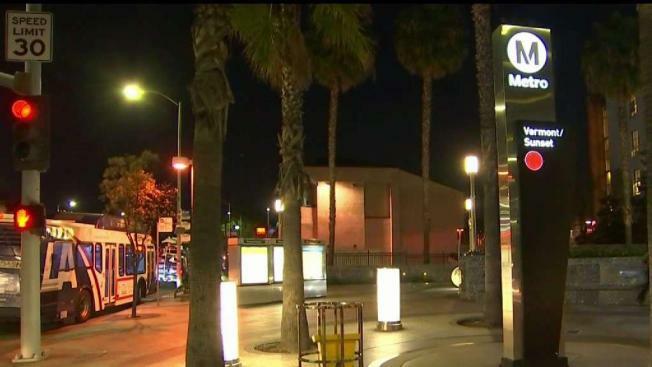 Police are stepping up patrols at an East Hollywood metro station after a woman was beaten and raped. Reported by the NBC4 News on March 22, 2019.